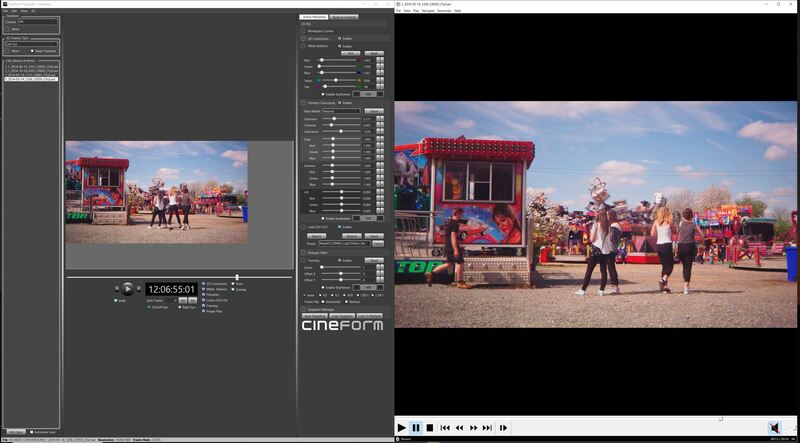 I was eternally frustrated by the demise of Cineform mainly because of the inability to license the software. I had bought so many licenses over the years worth thousands of dollars. Turns out that Gopro Studio gives me issues that Firstlight didn't. Clips showing up as black frames plus a few more issues in Studio. I LOVE Firstlight - it just works and am too old to learn Resolve. So I decided to go through my remaining licensed workstations to find a Firstlight version that was not covered by copy protection in that it would at least start up - later versions don't even open. Turns out I found one - from earlier in the product life cycle. Not sure about whether it is the best version but it does work okay with the odd issue. But the files grade as expected. You will need to have Cineform of some flavour installed. Perhaps even the latest Gopro Studio that had the tools. GoProStudioPC-2.5.7.549 - I think? Google it. Anyway - seems to work even on a USB stick so is transportable. I just copied the WHOLE folder and zipped it. Look in the 'tools' folder - find Firstlight and enjoy. The look installer is also in there to install 3D Luts in .look format. EDIT: Apologies but I am still experimenting whether this is a workable solution as I have hit a snag. I find that after working for a bit the screen goes grey so maybe it is back to the drawing board? Maybe the copy protection does kick in. Anyway - small inconvenience to me. Will keep experimenting to see if I can track down any earlier versions. Would appreciate to know if this happens to everyone or just my workstation as Cineform does some funky things here in Gopro studio as well. Last edited by Henry Olonga; April 13th, 2019 at 08:17 AM. Just tried it out Henry as I'm running with GoPro Studio 2.5.7.549. 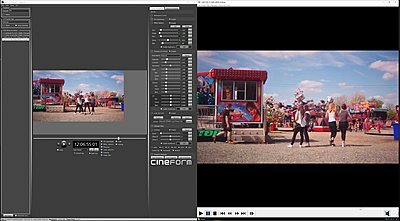 Found this to be the best version of GoPro Studio. Only tried a few times on different files for around 20 minutes and so far no grey screen. On an OC'd 8700k with a 1080Ti card running HD files the CPU is running around 7-9% and the GPU 3-5%. Oh so little effort! I love Cineform. Forgot just what a great little bit of software Firstlight was. And all the way back from 2010! Thanks for the opportunity. And it all seems to work fine here. Will see how things work out over time. Don't forget to set the decoder quality settings accordingly for playback otherwise in the case of RAW files they may get played back at less than optimal quality and may have you scratching your head at how soft it looks. (demosaic type ) perhaps one of the better settings - like Adv detail3 in the taskbar ( For program playback like MPC-HC ) and to Full resolution in Firstlight. View - Full resolution. As long as you have a fast computer of course. Here is a screenshot - BMPCC - RAW. I love how quick it is to get results across an edit. You can copy and paste from clip to clip and tweak as you go. Even paste on a whole bunch of clips. Magic piece of kit really. I really have no clue how this ended up as abandonware by Gopro ( eventually open source ). So useful. To me the white balance feature is the Key. Blackmagic pocket footage ( original ) always needed a good white balance to get the subtle hues out of it IMHO. In addition - I also have another abandoned piece of kit to turn CDNG into Cineform RAW if anyone wants to pm me.